One of my favorite writers is Seth Godin. I’ve been reading his books and blog for years because his advice for creatives is paradigm-changing. But life was throwing me some challenges. I bought my ticket then and there. I was going to New York City to ask Seth Godin my question! Once in New York, I visited an incredible performance coach named Kate Schutt. Kate helped me to think through my question for Seth Godin and new ways to frame it. I was so ready for this! As I headed toward the Smart Hustle Small Business Conference, mentally practicing how I’d ask Seth Godin my question, I knew I was prepared, but yet the pressure was immense. Do you ever start bossing The Universe around? Do you ever start demanding that it follow your narrative instead of allowing life to reveal its own? As I hustled down the busy city street, I caught sight of an old man sitting in a dingy diner. He was hunched over, gazing sadly out the window as the world rushed by. Something told me to stop, to go back to that diner. I placed my hand on the window in front of the old man and I smiled. His eyes rose to meet mine. And then he slowly raised a shaky hand to the dirty window. Through the cold glass, we could feel one another’s warmth. We stayed there, oblivious to the world, smiling. As I continued toward the Smart Hustle Small Business Conference to ask Seth Godin my question, I felt a weight lift. What if I didn’t come to New York City to ask Seth Godin a question? What if it was to make an old man smile? What would that say about my work? What would that say about the success of this trip? What would Mr. Seth Godin have to say about that? I’d been nervous about The Smart Hustle Business Conference. I’m an artist who’s only ever worked with art people. I’ve never been to a proper business conference before. I’d never seen so many men in suits! But I needn’t have worried; it was a brilliant and generous group. It turned out to be a powerful, well-spent day. I sat front and center, so that when Seth Godin spoke I could be first to ask him my question. At a break between speakers, I stepped out to stretch my legs. Guess who was walking into the building? That’s right. Seth Godin. 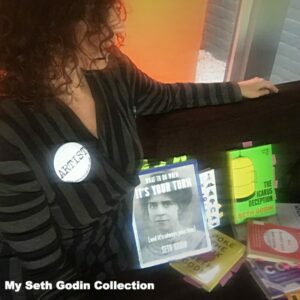 I approached Seth Godin and introduced myself. I was about to ask my question but then for some reason, I decided not to. Instead, I reached into my bag and pulling a dog-eared copy of one of his books. It was full of sticky tabs marking ideas that had made a difference to me. And then I had the privilege of shaking Seth Godin’s hand. I returned to conference room, elated. When Seth Godin took the stage he spoke about the new economy, the new way the world is doing business, the recipe for success in today’s market. “Start with what you can give. And end there,” he advised. Start with what you can give. And end there. I never did ask Seth Godin my question. Yet I left New York City confident that I’d been given the answer. It’s about seeing others. And letting them see you. It’s about showing gratitude, and not need. It’s about allowing the answers to reveal themselves, instead of dictating their terms. It’s about starting with what you can give. And ending there. Thank you, Seth Godin for answering my question. Join my mailing list and get the posts artists keep talking about + FREE ARTIST GIFTS.